January 1 1879, commenced charging for grave and plots. All burials are in St. Mary’s Cemetery Hunter, N.Y., unless otherwise noted. There are people listed in "burial" section of ledger whose names do not appear in the index. Many people listed in this ledger as buried in St. Mary’s Cemetery will not be found in the documented monument record in the cemetery section of this booklet; apparently they were buried with out stones or markers. Ledger is approx. 12"by 7" in size, consists of alphabetical index, the pages 1-165. "St. Mary’s Cemetery Hunter, N.Y.
Commenced charging for grave & Plotts"
Ink used for some entries is fading, making some names difficult to read. Bridget Hiland died on 1st day of January 1888, was buried 3rd day of January 1888. Rec. R of church (last rites) on grave $2.00 has been paid to A. P. Loomis on church debt. S. J. C.
April 17- Two burial lots were sold to John Burns at North-west corner of church—Price $6.00 which was applied to church debt. (no year given – same hand writing as page 10, 1885? Oct. 13, 1884 James Glennon son of Owen Glennon, died October 12th aged 12 yrs. Richard Lynch died Mach 23, 1885 age 83 yrs. Catharine O’Kelly b in Ire, Co. Carlow d in Shandakan Apr. 27, 1871 age 6__? Margaret Burns his wife d Mar 16, 1888 age 85 yrs. "Erected by Michael and Margaret Farrell"
____section "stone laying by W. side of Church"
Richard Lynch b June 18, 1802 in Ballymore, Co. Meath?, Ire d Mar 23, 1885 age 83 yrs. "May her Soul Rest in Peace"
"May his Soul Rest in Peace"
Deep in the Catskill Mountains, at the foot of Hunter Mountain, where it has stood for nearly one hundred and fifty years, is the church known as Saint Mary of the Mountain. It is a peaceful little country church, and at first glance appears to be nothing extraordinary, perhaps not even worth preserving. But a closer look reveals that it is, in fact, a very special church. It is carved from the very mountains that surround it, the stones for its foundation, the hemlock and basswood of which it is constructed, right down to the lace on its altars, fashioned by the loving hands of those who, generation after generation, worshipped within its walls. It is the oldest Catholic church in the Catskills, and, very probably, the oldest building of any kind in the Catskills still in use for its original purpose. How it came to be, and how it weathered the seasons and fortunes of the many years, is a story well worth the telling. Long before Henry Hudson sighted the mountains from the river that bears his name, the Indians of the region called the range which rises from the plain some ten miles west of Hudson River, Onteora, Mountains of the sky. They believed it to be an evil region, full of inimical spirits, and though they hunted its deep hemlock forest, no Indian village was ever located there. One legend has it that an ancient squaw lived deep in the rugged peaks, entrusted by Manitou with the sun and the rain. These she kept sealed in her wigwam, and let them out according to her own whim. The gentle rains or the raging storms, the warm sun or the cloudy skies of deep winter reflected her moods. Even the moon was her work: once a month she hung out a full moon which she then slowly chipped away to create stars until it was entirely gone, and then a new moon was made to replace it. Her anger was not to be taken lightly, and so the Indians kept their distance from her domain. On the fifteenth of September in 1609, an Englishman, Henry Hudson, with a Dutch crew, and under the auspices of the Dutch East India Company, sailed his ship, the Half-Moon, up the Hudson River as far as the point where the city of Albany is now situated. They dropped anchor for the night at a spot on the river near the present town of Hudson, and claimed the lands for Holland. Except for forts constructed in New York, Roundout and Albany, no attempt was made by the Dutch to found a settlement in the region. Individual Dutchmen bought tracts of land from the Indians, which they then had titled by the Knickerbocker governor. The Dutch called the mountains the Katsbergs, the Mountains of the Wildcats, and the many streams were known as "kills". The most important, running into the Hudson, was known to them as the Katskill. Later, the English were to refer to the whole area as the Catskill Mountains, and so they are still known. For nearly a century, the Dutch dominated the region, but around 1700, English settlers began arriving in good numbers, and the towns of the plains were established, as well as a few scattered hamlets in the mountains themselves, breaching for the first time the "Wall of Manitou". These latter slowly grew to the point of organizing municipal governments, Greensville first in 1768, Jewett in 1783, Durham and Lexington in 1788, Windham in 1790, and Hunter in 1813. The mountains were too rugged and the weather too severe for any extensive farming, and so the early settlers survived by hunting and by the sale of a crude potash made by burning the abundant hemlock. In the late seventeen hundreds, a new industry began to grow in the Catskills, tanning. Shiploads of hides came up from South America, were carried up the Hudson, and then hauled by a circuitous route through Mink Hollow into the interior of the mountains, to Hunter and Prattsville, where, because of the abundance of hemlock bark and clear spring water, the two largest tanneries flourished. Between 1800 and 1850, nearly fifty thousand men were employed by these two tanneries alone, and it is estimated that the tannery at Prattsville itself processed twenty million hides during this fifty year period. It was during this period that Ireland was suffering under persecution and famine. Much of her population fled to the shores of America, and many found their way to the Catskills for employment in the tanneries. To their sorrow, they were without the services of a priest. It was not until 1826 that a resident bishop, John Dubois, was established in New York, and he began organizing the scattered church of New York State. He became aware of the needs of the Irish workers in the Catskills, and beginning in 1830, a priest was sent out from Saint Mary’s Church in Albany to celebrate Mass for the tanners and their families. For lack of a church, Mass was celebrated alternately, though infrequently, in the homes of Dennis Dunn of Hunter, and of Lawrence Norton in Platte Clove. We do not know the names of these first priests, but the pastor of Saint Mary’s in Albany at the time was Father Charles Smith, and he may well have been the first to celebrate Mass in the Catskills. On August 12, 1839, Bishop Dubois sent the Reverend Bernard O’Farrell form Saint Paul’s Church in Harlem, to organize a parish in Hunter, and to build a church and lay out a cemetery. A subscription was taken up among the residents of Hunter and Platte Clove, as well as Westfall, Shandaken and Bristol near Woodstock. The list of the original subscribers contains names that are still familiar on the Mountain Top: John Burns, Peter Carr, Michael Dolan, William Gillespie and Darby Kennedy each gave $10; Thomas Geogham and Cornelius McGuire gave $9; Martin Shields offered $6; and a long list of $5 subscribers included Michael Askin, John Brannon, James Burns, Patrick Burns, William Cannon, James Caulfield, John Dale, Roger Donnell, Michael Dougherty, Condy Fagan, William Hopkins, George Kelly, Edward Kilday, John Kilday, Martin Kilroy, Patrick Lane, Thomas Lane, Richard Lynch, John Molloy, Patrick Norton, Condy O’Donnell, James O’Donnell, Peter Quinn, John Shanley and Charles Shevlin; Dennis Dunn, whose home was used for Mass until then, gave $3; William Burns and William Lawler each donated $2; and finally Lawrence Norton of Platte Clove who had also opened his home for Mass before the building of the church, gave $1. With a grand total of $212, Saint Mary of the Mountain came into being. A plot of land was purchased from Robert Kerr on October 17, 1839, for $50. The cemetery was laid out, and work began on a simple structure, 30 feet by 20 feet, of hemlock and basswood. Before the church could be completed, the little daughter of Michael Lackey and Mary Ann Glennon, not yet three years old, was the first to be buried in the churchyard. The structure was completed in June, and on the 23rd, Father O’Farrell celebrated the first Mass in the tiny church. In 1841, Father O’Farrell was recalled to New York City, and was succeeded as pastor by Father Michael Gilbride. His parish was expanded to include Gilboa, Ashland and Hudson, across the river. He resided in Hunter for the first year and said Mass once a month at each of his stations. In 1842, he took up residence in Hudson to oversee the birth of the church in that village. In 1843, he constructed the little church dedicated to Saint Joseph in a diocese with Bishop John McCloskey, later to be Archbishop of New York and the first American cardinal, as ordinary. Saugerties remained part of the Albany Diocese until 1864, and so, in 1847, with new organization in the diocese, Father Gilbride was named pastor of Saugerties and Hunter, continuing to serve both places until 1849. Because of failing health, Father Gilbride retired in 1849, and was replaced as pastor by Father Lawrence Considine in 1850. The tanning industry was at its peak, and Father Considine expanded the original building to accommodate his growing parish, adding the present sanctuary, topped by a small belfry. Throughout his pastorate, he resided in Hunter, but served Ashland, Shandaken and Middletown, now Margaretville, as well. He built churches in both Albany and Middletown. In 1854, Father Eugene Carroll followed Father Considine as pastor, and the parish was again reshaped to include Gilboa, Ashland and Margaretville. Father Carroll removed his residence to Windham Center for convenience sake, and Hunter was to be without a resident pastor until 1874. It was a troubled period, because the mountains had been nearly denuded of the hemlocks, and new chemical process was replacing the old tanneries. Many of the families moved out, and the great tanneries fell into ruin. Except for occasional foundation stones to be found along the Schoharie and Catskill Creeks, no traces of them remains. A few were made into sawmills, to process the hardwood trees still remaining after the disappearance of the hemlocks, and for about twenty years, the mountain top communities barely survived on the production of barrel hoops and chairs. Saint Mary of the Mountain, though not suppressed as a parish, came under the care of the pastors of Saint Patrick’s in Catskill, Father J. H. W. Maeyers from 1859 until 1868, during the Civil War period, Father Bartholomew Grattan, who followed and cared for Hunter until 1870, and his successor, Father Edward O’Driscoll, who provided Mass in Hunter until 1874. During the pastorate of Father O’Driscoll, a new turn of events brought lift back to the moribund parish of Saint Mary of the Mountain. The Roundout and Oswego Railroad had run a line from the Hudson River at Kingston through Phoenicia, Shandaken, Arkville, all the way to Hobart, bringing floods of summer visitors to the area. In 1875, the Roundout and Oswego went into bankruptcy and was reorganized as the Ulster and Delaware Railroad. In 1882, the Stony Clove and Catskill Mountain Railroad, owned by the Ulster and Delaware, was built, leading across Stony Clove from Phoenicia to Hunter. The following year, 1883, the Kaaterskill Railroad, also owned by the Ulster and Delaware, was built from Kaaterskill Junction, where it connected with the Stony Clove and Catskill Mountain Railroad. It ran through Tannersville and Haines Falls all the way up to Kaaterskill Station where the already venerable Catskill Mountain House stood. The Catskill Mountain House had been built in 1823-24, and from high up on North Mountain commanded a magnificent view of the Hudson Valley and River. In 1872, only one other major vacation hotel was in business, the Laurel House, just a short distance from the Catskill Mountain House, at the head of a deep gorge into which the Kaaterskill cascaded in graceful falls. The railroads promoted the Catskill area as a resort, cool and refreshing in the summer to those who wished to escape the heat and clamor of the city, and construction of resort hotels began at a break-neck pace. By 1884, Hunter boasted five large hotels. The St. Charles, originally called Breeze Lawn, the original Hunter House (now replaced by a later building), Central House and Prospect House all had accommodations for 200 guests. The smaller Kaatsberg Hotel on the banks of the Schoharie Creek, provided its 100 patrons with every luxury of the time. To the north of Hunter, and in Haines Falls and Tannersville to the south, more hotels and boarding houses, though with smaller guest accommodations, brought in thousands of visitors to the area. Near the Catskill Mountain House, the new Hotel Kaaterskill had been built, and between the two institutions, 1400 visitors could find rooms. The Laurel House, in 1884, catered to nearly 300 guest. In fact, in the area served by Saint Mary of the Mountain, according to the 1884 summer guide of the New York, West Shore and Buffalo Railroads (into which the Ulster and Delaware linked), there were 11, 270 beds available to visitors. Needless to say, all this construction demanded the service of many people, and the hotels, once in business, needed to be staffed. The need was increased also by the fact that several clubs had sprung up in the areas along the Ulster and Delaware track, most notably, Onteora Club, Elka Park, Twilight and Sunset Parks. These were private reserves with summer cottages built around a central club house. A new generation of laboring class Catholics flooded the region, and it was quite obvious that a resident pastor needed to be assigned to Hunter. Father Aloysius Murphy accepted that post on May 1, 1874. 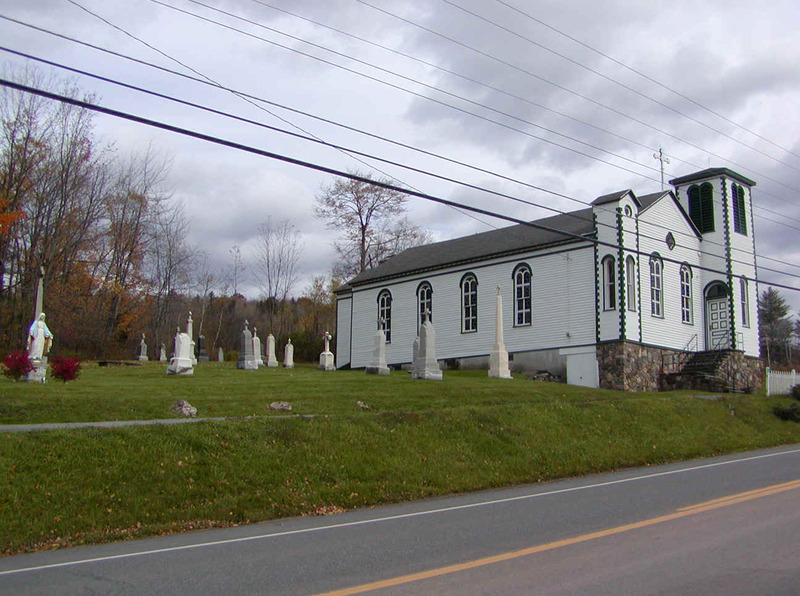 New parish lines were drawn up, which included Margaretville, Delhi, Ashland, Prattsville, Windham, Platte Clove and Stamford, where a small mission church had been built in 1871. The most immediate need was to restore the Church of Saint Mary of the Mountain, which had been much neglected for sixteen years. Father Murphy added the main entrance with its two towers, one small and the other larger, removed the small belfry from the 1850 addition and replaced it with a skylight, and added the choir section and sacristy in 1875. The Hunter church now had its present dimensions and configuration. Father Murphy left Hunter for a new charge in Rome, New York, in 1876, and was replaced by Father Simon Canane, who remained pastor for seven years and was succeeded in 1883 by Father P. H. Delehanty. When he died in 1888, a new pastor was assigned, Father Hugh O’Neil, and the parish lines were again redrawn, to include Haines Falls, Tannersville, Platte Clove, now known as Elka Park, Lexington, and, of course, Hunter. These parish lines remain the same today. During his tenure as pastor, Father O’Neil built the first Saint Francis de Sales Church in Elka Park in 1891, and, in 1895, he built a church in Lexington which he also dedicated to Saint Francis de Sales. The Lexington Church remains today essentially as it was when first constructed. By 1896, Father O’Neil had gone blind, and from the Biographical Review of 1899, we have a poignant portrait of the old man making his circuit accompanied by one of the parishioners as guide, who stood beside him at the altar and read to him the words of the liturgy, which the venerable pastor then repeated aloud in order to provide his flock with the Holy Eucharist. He was the founder of the Rosary Society of the parish. By 1900, his health had deteriorated to such a degree that he decided to return to his native Ireland to await death. Unhappily, he died aboard ship before he could reach his home in Dungarvin in County Waterford. He was remembered as saintly, brilliant and not a little eccentric by the people of the parish, and it was a saddened flock that bade farewell to the sixty-two year old pastor as he left the Catskills, worn out by his labors. Father O’Neil was succeeded by Father Arthur J. Kelly as administrator of Saint Mary of the Mountain. In 1904, another of the great figures of the past became pastor, Father William Keefe. Shortly after his appointment, Father Keefe renovated the interior of Saint Mary of the Mountain, installing electricity, new altars, the pressed metal interior walls that are now in place, and the Munich stained-glass windows of which only one remains, the small rose window of the Four Evangelists above the choir area at the south end of the church. To the immense gratitude of the parishioners, he also installed a furnace, and winter services became more a matter of piety then endurance. At the beginning of the twentieth century, the tourist trade within the parish had become immense in the Haines Falls area, with the Catskill Mountain House, the Laurel House, Hotel Kaaterskill, the Lox-Hurst, Haines Falls House and dozens of other smaller hotels and boarding houses, as well as the flourishing private resorts known as Twilight and Sunset Parks. For a short time in 1905 and 1906, Father Keefe celebrated Mass at The Antlers Hotel on Mountain House Road in Haines Falls, but in 1906, he purchased the Levi Haines property and began construction of a new church. The Hunter Review of July 12, 1907, published a lengthy description of the building and the ceremonies as Father Keefe celebrated the first Mass in the Church of the Immaculate Conception on Sunday, July 6, 1907. According to a small brochure put out by Father Keefe in 1906, the entire projected cost of the new church was $5000. Shortly after the completion of the new church, the pastor transferred his residence from Hunter to Haines Falls to the former Haines Home, which remains the rectory now. In 1912, Father Keefe presided over the construction of the new Saint Francis de Sale Church in Elka Park. In the parish archives is deposited a document, probably written about 1959, and unsigned. It appears as an article in the 1963 edition of the Vacation Bulletin, where Clara Lackey is identified as the author. It recounts the building of this new church in such a charming manner, that it demands to be quoted in its entirely. "The passing of the late Mr. Arthur Showers, Sr. (1875-1958) recalls the story of the building of the Elka Park Church. As all these stories connected with the history of the parish are of interest, I know you will want to hear this one. "Once upon a time, many years ago, there was a little shed-like church building alongside the road leading to Platt Clove. At the time of my story, it had just about completely outlived its usefulness as a meeting place and had become entirely inadequate to accommodate the ever increasing congregation and the ever growing needs of the day. "Now, also, and at the same time, there lived during the summer months in Platt Clove, a Mr. Francis H. Lewis. He was a Protestant, a very fine gentleman indeed, and one known among his intimate friends for his many beneficences. "It so happened that one lovely spring morning, when all the world was in tune and he was feeling in his usual generous mood, that Mr. Lewis called on our then pastor, Father Keefe. He told Father Keefe that he had frequently observed the apparent devotion of the country people attending Mass at Elka Park,- that it seemed their faith deserved a better church. He proceeded to tell the very willing listener that he was personally very much interested in replacing the present structure with a proper and suitable church for the Catholics at Elka Park. His ambition was most pleasing and wholly acceptable to Father Keefe. Now, if anyone expressed a good intention to Father Keefe, he never let it get cool, but immediately let it bear fruit. "The good pastor went into prompt consultation with Arthur Showers, describing to him in minute detail a little chapel he had much admired while visiting France. He asked the always very helpful Mr. Showers to proceed with plans and to give an early estimate of cost. Very promptly this work got under way and Mr. Showers came up with a figure of $6000. On being advised of this, Mr. Lewis told Father that he was not only willing and ready, but greatly pleased to give the entire amount; however, he felt that the parishioners should be given the opportunity to evidence their personal interest in contributing toward it. He asked Father Keefe how much he thought the people would be able to give without it being the slightest burden or strain of any kind to them. Father suggested $1000. The parishioners cheerfully raised that sum. Mr. Lewis gave Father $5000. When incidental expenses went $500 over the original estimate, Mr. Lewis gladly gave Father Keefe the additional sum. "St. Francis de Sales Church, the gift of a fine Protestant gentleman as a token of respect for the devotion of the Catholic country folk, had been re-done through the years and conditioned as necessity required. Today it is appraised at a replacement value of $50,000. "The vacated church building was moved across the highway and for several years was used as a parochial school for the parish. "Mr. Showers was generous and co-operative all through the years in construction, reconstruction, advice, help and contributions, and the pastors here knew they would never ask in vain for anything he could do. It was fitting that he was buried from his own little church and that so many by their attendance there, showed the recognition and appreciation of this parishioner and the many helpful things he had done during his life time in this parish. Once upon a time, Mr. Showers was "a fine Protestant gentleman" who became an outstanding convert to Catholicism and lived happily ever after." It should be noted that Mr. Lewis also became a Catholic in later years. The Elka Park Church was dedicated on May 20, 1913, by Bishop Thomas Burke of Albany, and dinner provided at the old Elka Park club house. The menu shows a picture of the new church that is startlingly different in appearance from the church as it now stands. Painted in light colors with dark trim, and surrounded by rough, rocky ad untamed landscape, it awaits time and gentle care to bring it the beauty of age that it now possesses. St. Francis de Sales, Elka Park, is the only church in the parish with bells. The three bells, a gift of Mr. Jacob Hasslacher, were cast in Troy, New York, in 1912, and named St. Elizabeth (the largest), St. George and St. Agnes, after his wife and parents respectively. The oldest Catholic church in Catskill, St. Mary of the Mountain Church in Hunter is being renovated. The Windham Journal, Thursday, August 9, 1979. The Reverend Francis D. Dunbar, pastor of the Catholic churches of the Mountain Top, announced this past week that work would begin shortly on the restoration of Saint Mary of the Mountain Church in Hunter, the oldest Catholic Church in the Catskills. A campaign is currently underway to realize the $50,000 needed to complete the project, which includes removal of the present foundation and entryway of native stone. They will be replaced with materials designed to withstand the problems of weather and land drainage, and re-faced with the original stone. In addition, the building will be made level again and the walls and roof re-inforced. The church was built in 1840 and has been in continuous use since then. During those days nearly 140 years a number of other Catholic churches were founded out of Saint Mary of the Mountain, including Saint Joseph in Ashland, built in 1843 by the pastor of Hunter, Rev. Michael Gilbride. Sacred Heart in Stamford, built by Rev. Thomas Reilly in 1871, Saint Francis deSales in Elka Park, by Rev. Hugh O’Neil in 1892, who also built the Saint Francis deSales church in Lexington in 1895. The Immaculate Conception Church of Haines falls was constructed in 1909 by the Rev. William Keefe, and the new Saint Francis deSales of Elka Park constructed, also by Father Keefe in 1912. In time the Hunter church became the mother church of all the parishes in the Catskills. Nestled among trees and surrounded by the tombstones of some of the earliest settlers of Hunter, the church of Saint Mary of the Mountain is a familiar sight to summer visitors and skiers as they approach the village of Hunter. Since the presidency of Martin E. Van Buren, it has been a landmark, deserving the attention of historians and the interest of the residents of the Catskills. The Hunter parish was originally formed in 1837 to serve the Irish immigrants who came to the Catskill area in the early 1800’s to work in the tanning trade. Among the names of the charter members of the parish are found those of families still prominent on the Mountain Top, such as Peter Carr, Michael Dolan, William Gillespie, Martin Shields, John Dale and Charles Shelvin. The 1840 church is built in a modified Roman - style architecture with barrel ceilings, of the local woods, then so abundant; hemlock and basswood. The original decorations and hand – carved furnishings remain along with (sentence not completed). In 1976 faced with the fact that pressed in Fleur-de-lis in the French style. The interior was restored and repainted in one original colors in 1973, and an early 19th century reproduction of Andrea del Sarto’s "Madonna of the Harpies" was hung in the sanctuary. The interior statuary was restored in 1974. In 1976, faced with the fact that Saint Mary of the Mountain would either have to be restored or abandoned as unsafe, the parish council of the Catholic churches of the Mountain Top voted to undertake the current project. Studies of the problems involved in restoration were made and architectural drawings submitted by Edward Luders of Elka Park, and contracts are currently being awarded. It is hoped that work can be completed by late autumn. Persons interested in the restoration project or desiring further information are invited to contact the pastor’s residence in Haines Falls.